Doomsday pundits will keep spreading the word of panic in markets as institutions are selling capital market asets and taking 'flight to safety' towards dollars; the main commentary from most 'experts' on channels was book out and hold on to cash; the very people who found stocks and valuations 'attractive' at 6000 levels do not see value now and would like retail investors to hold on to cash. Fact is that although some more corrections are expected in Nifty / BankNifty levels, some of the stocks are approaching critical buy zones. In my last post I had mentioned Larsen and SBI bands. 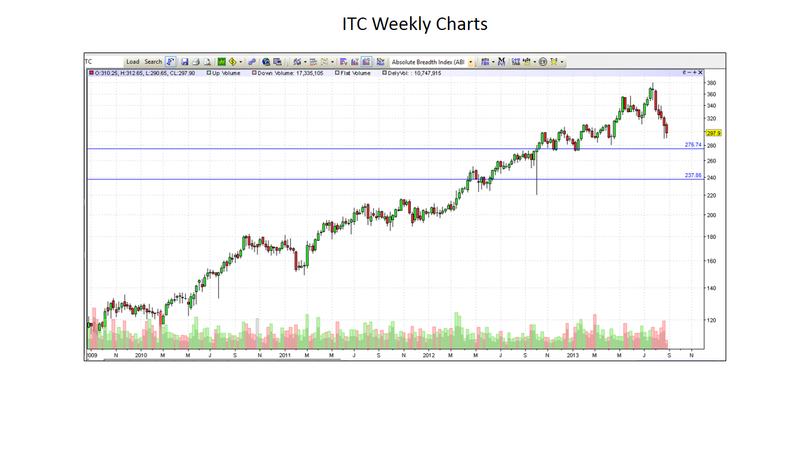 ITC - A stock in the consumption theme. Bulk of the revenues come from the tobacco business, followed by FMCG. The hotels line may not add too much in the bottom-line. 240-270 is a strong buy zone for longer term contracts of 375+ Dividends are also healthy. 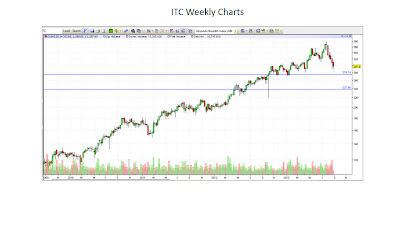 Keep a Stop Loss with 2 consecutive closes below 200 as that will open ITC for 150 where one can re-enter.